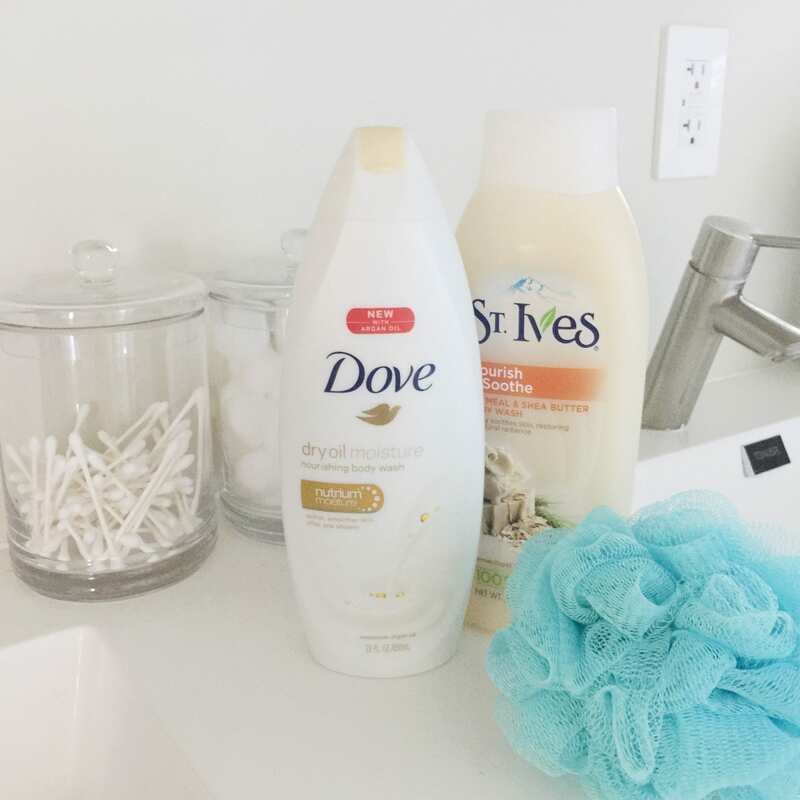 I spent the last couple of days spring cleaning at my house and it feels so good to freshen up the house and my routine to welcome spring! Here are five of my new spring favorites that I’m enjoying. 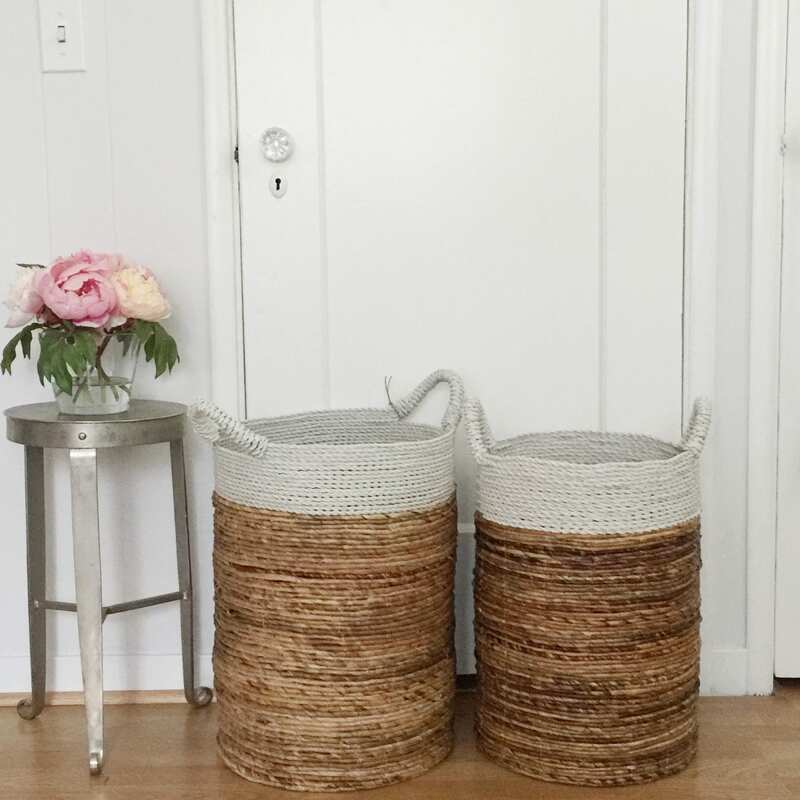 I’ve been using wicker baskets for storage in closets for over a year now but I recently found these cylindrical baskets and I love the way they look. I like the white wicker bands and handles for a slightly different look, almost like they have been dipped in paint! I’m going to use these to store extra blankets for lounging on the couch so they have a stylish spot to home. At any given moment, I have a candle burning in the house when I’m home. I love the way the scent fills the air and makes a house a home. 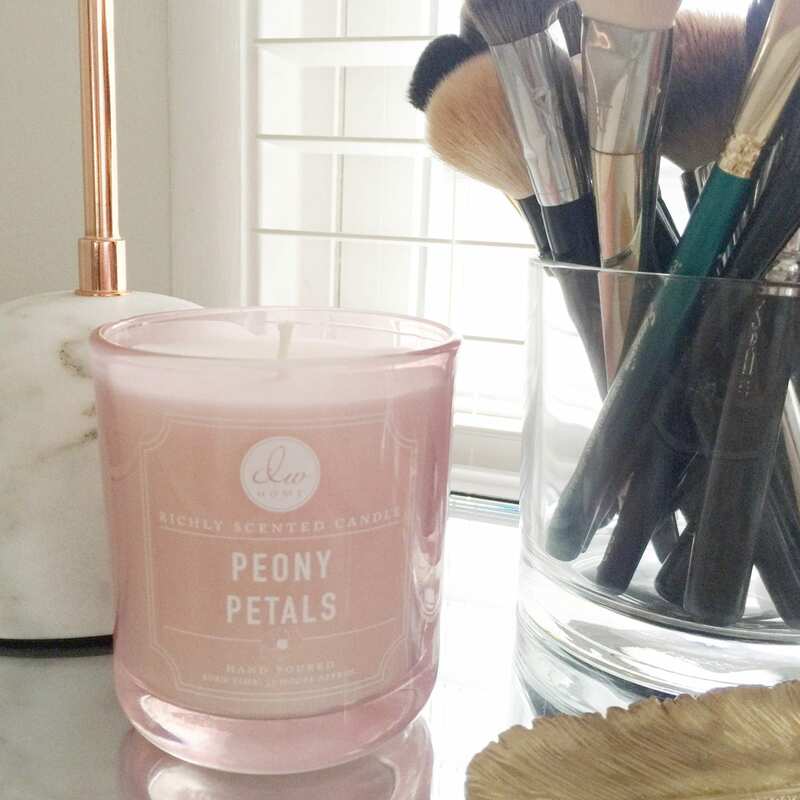 I recently found this Peony Petals candle by DW Home at TJ Maxx and I’ve been buying up every one I can find–they are that good. I’m a picky with my candles and I’m not a fan of ones that smell too sweet or artificial, so these ones are a nice balance of natural peony scent. I keep one in my office and another on the kitchen counter. If you see more of these, snag them for me, k? 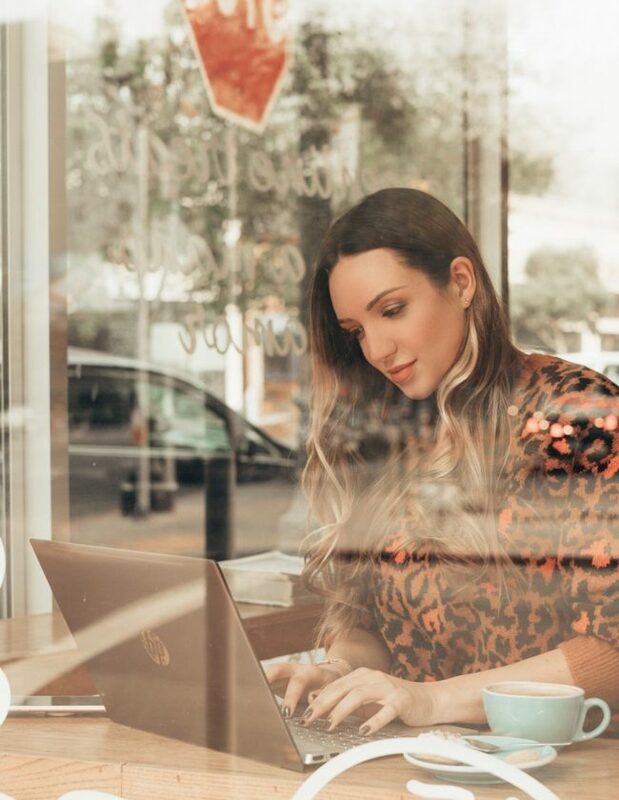 Ok quick update–I wrote this in the afternoon and then received another one of these candles as a gift this evening…this must be my signature candle scent! So in love! I love moving some of my fall and winter booties aside and pulling out spring sandals and open toe shoes. 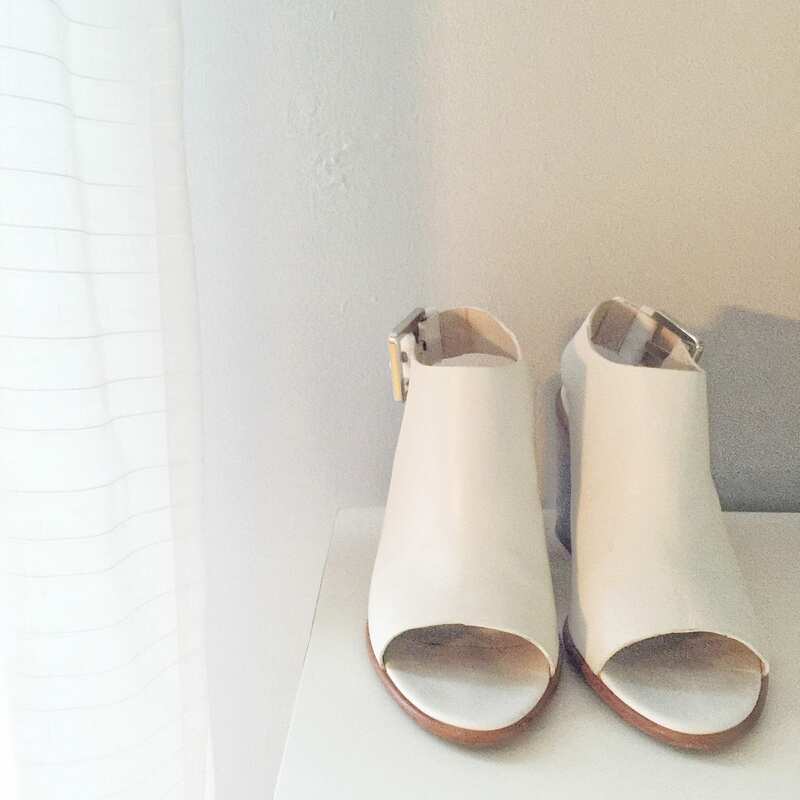 I got this pair of white leather chunky heels from Zara last spring and am so excited to wear them this week! I’m so excited to actually have a backyard now and have been decorating like crazy (maybe a post on that soon?). In addition to having a few potted plants, I’ve been wanting to plant some beautiful flowers to add some color to an otherwise very green yard. 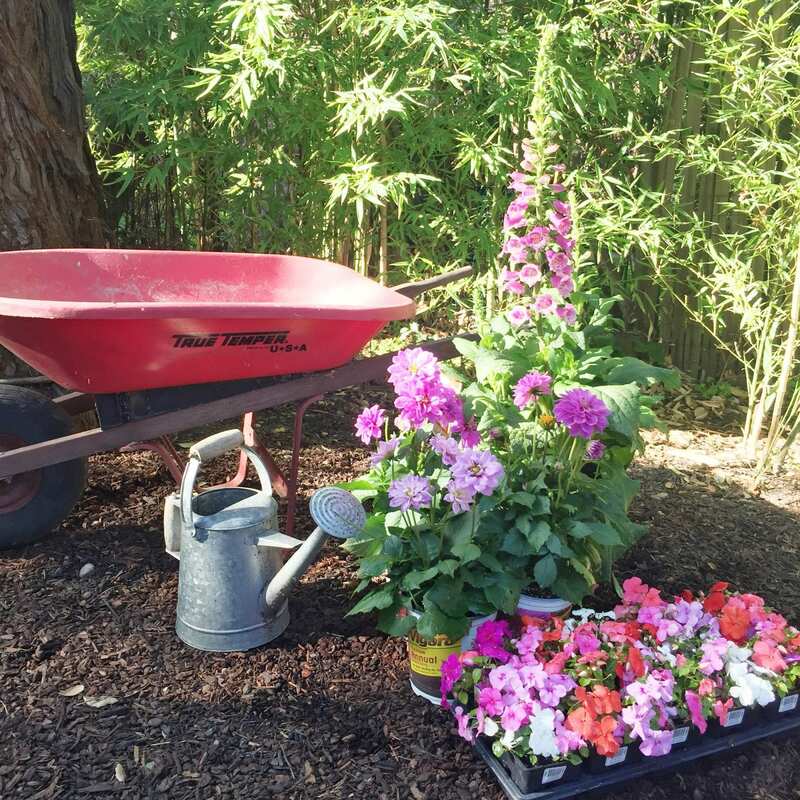 How cute would it be to plant all of these flowers in the wheelbarrow? Head into your nearest Target store to load up on all of your favorite beauty brands to help you do so, and save while you’re at it! Enjoy up to $40 in beauty savings when you text SPRING to TARGET (827438). 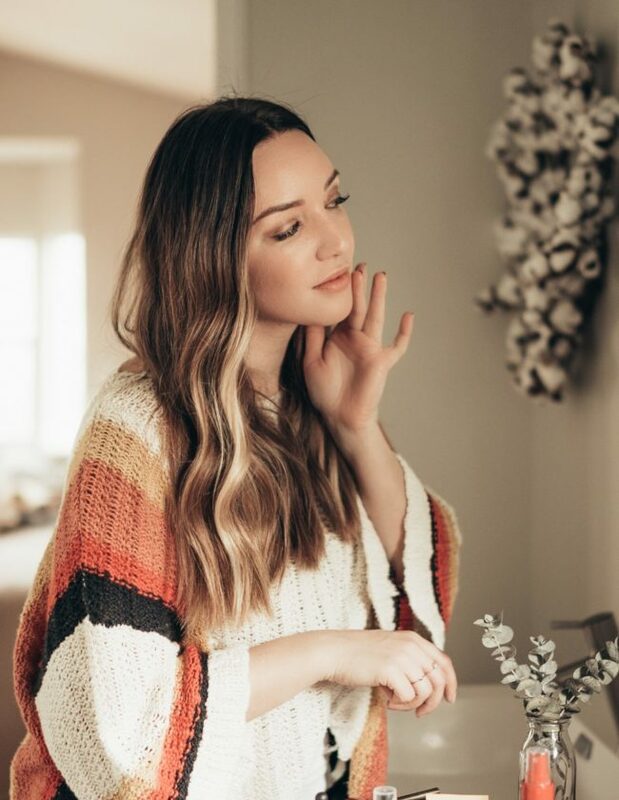 My favorite things about spring are definitely the brighter colors, open windows, planting and of course great skincare. I use dove because of my dry skin. I love those baskets, they’re so stylish! I need something like that myself for my bedroom. My boyfriend keeps throwing his work shirts in the corner, haha. Those open toe booties are lovely, too! Spring is in the air, and it’s fabulous! Your white, open-toe shoes… LOVE THEM! Must get some. You also reminded me that I need to start planting. Eeeeek, I love all the flowers!! I wish we had space to plant some, but we only have room for a few pots on our patio and I save them for veggies and herbs! Love your list of spring faves! I will be heading to TJ Maxx soon to see if they have any of those candles to try out! Having a yard is so great (except for all of the weed pulling) getting to plant all those awesome flowers! Hope you enjoy this spring and summer with those awesome flowers! Thanks for sharing. TJ Maxx always has the best candles – I’m hooked! We always hit tj maxx for candles and sometimes body lotion. Thank you so much!